When I grew up I only knew of Canada for one reason: Rick Moranis. As I grew up, I realized it was so much more. I mean Bryan Adams people! OK, seriously, nowadays it’s became sort of a go-to spot for emerging music talent to break through in the states. From Justin Bieber to Drake, our northern neighbors are tearing it up on the US charts. Well, it’s time to add one more Canuck to the fray. 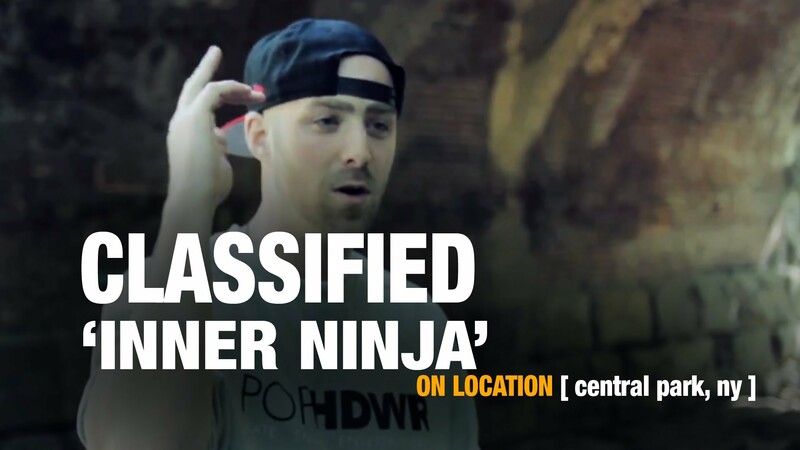 Classified is a Canadian MC from Nova Scotia, who is so much cooler than that just sounded. His self-titled album will be released this summer, and its first single “Inner Ninja” is kicking its way up the charts. See what I did there? I said “kicking” because ninja, like, kick. Between yourself, the Biebs, Metric, Drake and a bunch of others, Canadian music acts are gradually taking over the US charts. What do you make of this recent trend? I think it’s just a refreshing change..everythin-g gets old every couple years.. it goes back to the days of Neil Young, Bryan Adams Celine Dion…every once in a while us Canadians come down there and make a little noise. True…like “Inner Ninja.” There’s a great message to the song, but I’m curious…if you unleashed your own “Outer Ninja” on someone, what would it look like? I’m thinking pretty similar to Mike Tyson’s fights.. more so when he bites people’s ears.. something close to that. David Myles came over to the studio for five or six hours, just playing me different riff’s on his guitar, singing different vocal pieces. We had another song we were about to do, and then right before he left the studio, he said he had another idea, played the guitar line and sang the first line of the song… “I read the rules before I broke ‘em.” As soon as I heard it, I knew it had something cool about it. I recorded his part [then] he left. I worked on the beat, wrote my verses, [and] David came back to the studio. We worked out the part with the kids and spent a day arranging the song and that was it. What can you tell me about the upcoming album that you haven’t told anyone else? Mmm… that’s classified information. Gotta wait. Good things come to those who wait! 12. “Blurred Lines” – Robin Thicke/Pharrell/T.I. Jon Chattman’s “A-Sides Music” series usually features artists (established or not) from all genres performing a track, and discussing what it means to them. This informal series focuses on the artist making art in a low-threatening, extremely informal (sometimes humorous) way. No bells, no whistles — just the music performed in a random, low-key setting followed by an unrehearsed chat. In an industry where everything often gets overblown and over manufactured, I’m hoping this is refreshing. A-Sides celebrates its two-year anniversary with a concert in White Plains, NY on Saturday, July 27 featuring Kopecky Family Band. Get your tickets here.